Yamana Gold Inc.(TSE:YRI) was the best performer in a strong gold sector on Wednesday despite reporting a 28% fall in third-quarter profit and uncertainty about whether it will meet production targets this year. 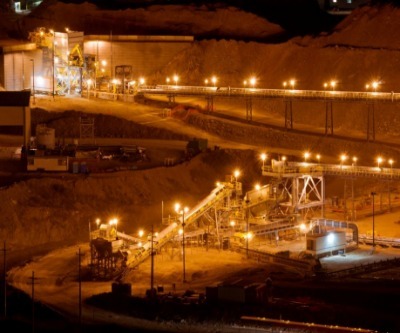 Yamana held to its full year production targets which it cut in July to between 1.32 million and 1.37 million gold equivalent ounces from a previous forecast of 1.44 million ounces as it ramps up production at two new mines. The Toronto-based company said all-in sustaining cash costs at its 8 operating mines in Brazil, Argentina and Mexico on a co-product basis were $888 per gold equivalent ounce, falling from above $1,000 at the start of the year. You guys obviously use a much lower number than most. Are you guys sort of reviewing that given this sort of correction in process, or are you happy where you guys are? We’re happy using $950. I think that is a – still a reasonable number to use. As you know Andrew, reserves are the long-term plan of any operation. And so we think the $950 is still a very respectable, sustainable long-term number. Even in the context to where metal prices are, and in the context of where some are projecting metal prices to be. It’s not below or nowhere near $950. So we feel that’s the reasonable number and there is a further point, which is when we’re comparing reserve growth year-over-year it makes for an easier comparison. It makes it easier for shareholders in this company and people who follow the company such as yourself, be able to say it’s not because of metal prices there has been an increase or whatever, it’s because they’ve actually been successful of finding new ones. Click here for Yamana's Q3 earnings call transcript.